Tiger Woods (and all eligible PGA players, for that matter) has until Friday at 5 p.m. to decide if he'll play in next week's Quail Hollow Championship. He typically makes his decision during this week before the annual Charlotte tournament, formerly known as the Wachovia Championship. Woods missed this event last year because he had knee surgery just a couple of weeks before it. He won the tournament in 2007. 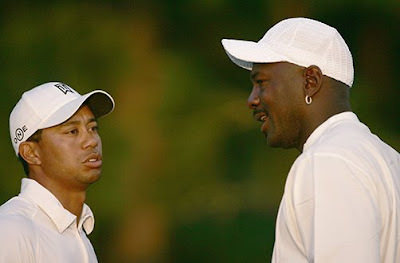 Most people remember that year because of the famous pairing of him and Michael Jordan in the Wednesday Pro-Am. There are a host of great players already confirmed for this PGA Tour event next week, including Phil Mickelson, Trevor Immelman, Sergio Garcia, Padraig Harrington, Vijay Singh, Jim Furyk, and the 2008 champion, Anthony Kim. The Quail Hollow Championship runs April 27-May 3. Tickets are still available. Visit www.quailhollowchampionship.com for more details.